Canned sardines go upscale in this easy Cream of Sardines recipe created by celebrated Basque Chef Martin Berasategui for Gastro Bar by MB, at Paradisus Los Cabos, Mexico. Try it for a luscious party appetizer, budget game day food or tasty snack. Purée all ingredients (less oil) until smooth. Serve the chilled cream pate within an empty sardine tin or a small decorative dish. Garnish with decorative ingredients and serve accompanied with small bread toasts. 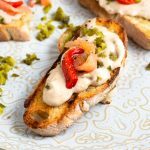 You can substitute well-drained, jarred roasted red peppers for the piquillo peppers and while they deliver the sultry taste of a charred pepper and add nice colour they lack the heat of a Spanish piquillo pepper. Fried shrimp is optional but is a welcome addition for a heartier snack.